Google today is rolling out an update to Google Docs that delivers new functionality to the document comment system that was put in place during an update in 2009. The new system is intended to make document collaboration more conversational, complete with the ability to tag people in comments and replies by way of the “@” symbol. When someone is tagged in comment, they will receive an e-mail notification — so there’s no need to continually check a document for new comments. Comments also now come with timestamps and profile pictures, making the whole system look very look similar to a Facebook comment thread. When a user receives an e-mail notification, they have the option of responding by replying to the e-mail or by clicking through to access the document. If a particular has many collaborators and a user becomes overwhelmed by a constant stream of notifications, Google has included the ability to mute e-mail messages so the user will only receive updates when they view the document. Once a comment has been sorted out among the collaborators, it can be marked “resolved” and removed from the thread to avoid cluttering up the document. 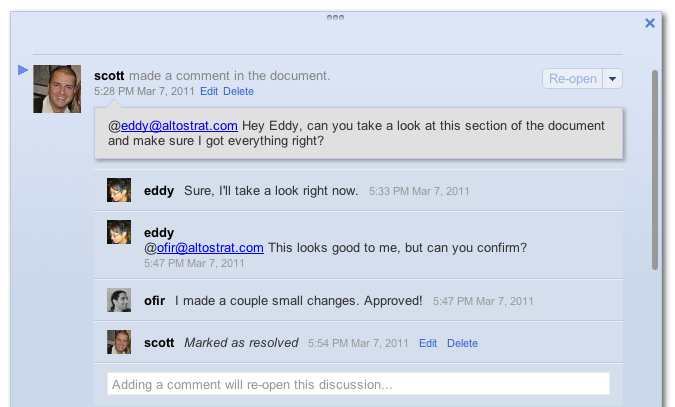 Resolved comments can still be accessed and re-opened through an archive. Google expects to make the new commenting system available over the next few days to all its users with a Google account and to Google Apps customers on the rapid release track. The new features are only available on newly created documents.